Synthesis of 2,3-Diaryl-2-azabicyclooctanones derivatives by multicomponent reaction promoted by Nb(OEt)5. Ultrasound-assisted synthesis of glycoporphyrin conjugates bearing carbamate and thiocarbamate linkers. Asymmetrical Henry reaction using copper (II)/2-oxazoline complex. A Two-Step Synthesis of the Bioprotective Agent JP4-039 from N-Boc-L-Leucinal. Three Step Chemo Enzymatic Continuous Flow Cascade Synthesis of 1-Monoacylglycerol. Study of the ortho-methoxy substituent group effect in selective demethylation reactions of methoxybenzoic acids. Targeting Echinococcus granulosus thioredoxin glutathione reductase using a Dynamic Combinatorial approach. Benzo[b]thiophene dimerization: A promising experimental finding directed to the C-3 functionalization with aryl alcohols. Towards the synthesis of 27-Deoxylyngbyabellin A analogues as potential chemotherapeutics. Acetonides as Masked Nucleophiles in the Gold-Catalyzed Spiroketalization of Monopropargylic Triols. Synthesis of β-enaminones catalyzed by nanoparticles of Fe2O3 in ultrasound and solvent-free approach. Phenanthridine derivatives via palladium catalyzed intramolecular functionalization of C(sp2)-H bonds. Syntheses of β-hydroxy-α-amino esters and non-proteinogenic α-amino acids from Morita-Baylis-Hillman adducts. An expeditious approach to (+)-polyoxamic acid and derivatives from asymmetric Morita-Baylis-Hillman reaction. Michael type reactions mediated by NbCl5. Studies on the Regio- and Enantioselective Heck Arylations of Acyclic Allylic Alcohols. Organocatalysts: Design, Synthesis and Application in Stereoselective Domino-Michael/Henry Reactions. Synthesis of triterpenes and steroids derivatives as potential anti- HIV and cancer compounds. Synthesis of tetrahydropiridines by one-pot multicomponent reaction using Niobium Pentaethoxide. Palladium complexes of aromatic bis-imines and bis-amines: synthesis and evaluation in Heck reactions. Synthesis and characterization of hydrogels from cellulose acetate by esterification crosslinking with EDTA dianhydride. Organoselenium functionalized nitrogen heterocycles: a proposition for new antimalarials. Synthesis of selenium-triazole-carbonitriles by organocatalytic cycloaddition of azidophenyl arylselenides with benzoyl nitriles. 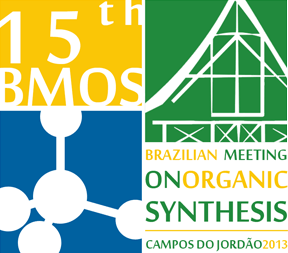 The organizing committee of the 15th Brazilian Meeting on Organic Synthesis wish to invite you to take part in this exciting meeting which will bring together the Brazilian Organic Synthesis community, distinguished lecturers and colleagues from all over the world to discuss the most modern aspects of the art of organic synthesis. The conference will be held at Campos do Jordão from november 10th to november 13th.